Ripple vs Bitcoin: Could Ripple be the Next Bitcoin? Ripple vs Bitcoin: What’s the Better Alternative? 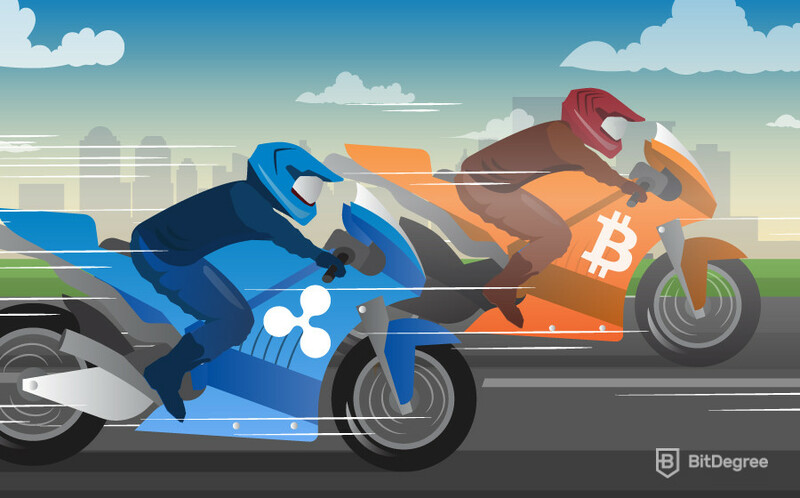 So, you’ve heard about two of the most popular cryptocurrencies, Bitcoin and Ripple, but you’re not sure what the difference between Ripple vs Bitcoin is? Or maybe you know what they do, but you’re not sure how the technology of these two cryptocurrencies compare? Either way, hold on tight, as I’m about to teach you everything you need to know! In this Ripple vs Bitcoin guide, I am first going to start with the basics. I am going to talk about things their purpose, their transaction speeds and the total coin supply of both projects. After that I am then going to talk about the decentralization of each project, along with the scalability of each blockchain. Finally, I’m then going to discuss how each project has performed so far. By the end of reading this guide, you will have all the information you need to decide which cryptocurrency is better. So, what are you waiting for? The first part of this Bitcoin vs Ripple guide is going to start by introducing both of these blockchains! 3 Ripple vs Bitcoin: Decentralization? 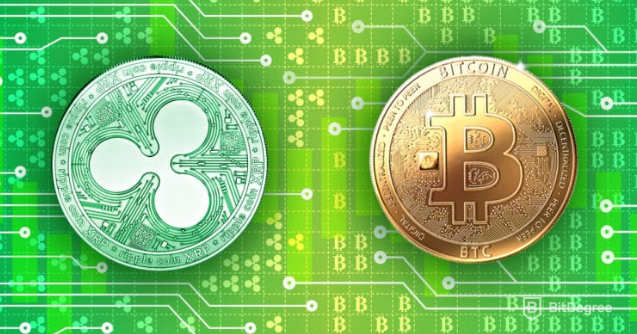 In their simplest form, both Bitcoin and Ripple are cryptocurrencies that are supported by blockchain technology, which allows people from all over the world to use these blockchains to send and receive funds. Both projects have their own native coin, which can be purchased online at a third-party exchange. Although at first these cryptocurrencies might sound very similar, there are actually some clear differences which I will cover now. Created in 2009, Bitcoin was the first and original cryptocurrency. It was built by an anonymous developer called Satoshi Nakamoto, who wanted to create a new global payments system that would allow people to send and receive digital money on a peer-to-peer basis. Peer-to-peer is similar to “Person-to-Person”, meaning that no third party or intermediary is required to process and verify transactions. As a result, the Bitcoin system is “Decentralized”, because it is not controlled by any single person or authority, nor is it controlled by any central bank, government or nation-state. Instead, transactions are confirmed by the contributing Bitcoin community, called “Miners”. Anyone in the world can become a miner by hooking a device up to their computer. In return for their time and electricity costs, those who are successful are rewarded with extra Bitcoin. If you’re a little confused, don’t worry, I’ll talk about this process in more detail in the next section! Bitcoin (BTC) also has a maximum supply of 21 million coins. The current circulating supply is 17.1 million, with the number increasing each day. However, there will never be any more than 21 million Bitcoins mined, and that figure expects to be hit in 2140. Now that’s Bitcoin explained, the next part of my Ripple vs Bitcoin guide is going to find out about Ripple. Ripple was first launched in 2012, three years after Bitcoin. It was built by a company called Ripple Labs who are based in the United States. The purpose of Ripple was to create a payments system that could be used by banks to transfer funds both domestically and internationally. Although they are targeting the financial services industry, anyone can buy and sell the currency of Ripple – the XRP coin. People often get confused about the difference between Ripple and XRP, so I’ll quickly clear things up. Ripple is the name of the blockchain technology that allows people to send and receive funds (these funds can translate into most currencies out there). On the other hand, XRP is the name of the cryptocurrency, much in the same way that Ether is the cryptocurrency and Ethereum is the blockchain. Just like Bitcoin, the Ripple blockchain does not require third parties to confirm and verify transactions, allowing people to send and receive funds on a peer-to-peer basis. In total, there will be a maximum supply of 100 billion XRP coins, with a current circulating supply of about 60 billion. So, now that you know the absolute basics of Ripple XRP, the next part of my Ripple vs Bitcoin guide is going to look at how each blockchain performs! When sending funds to another person, the Bitcoin blockchain takes approximately 10 minutes for the transaction to be confirmed. This remains the same no matter where the sender and receiver is located. Whether you are sending funds to somebody in the same city as you or to someone on the other side of the world, it will always take about 10 minutes! When comparing this to the time it takes to send money overseas with a bank, it is much quicker to use Bitcoin, as banks can take up to three days to process the transfer. When Bitcoin was first released, transaction fees were very low. In fact, it would cost just a fraction of a cent to get the transaction processed. This made Bitcoin ideal as a global payments system. However, as the system has become more and more popular, the amount that users have to pay has increased quite substantially. During its busiest period in late 2017, transaction fees were costing as much as $40, which isn’t sustainable for micropayments to say the least. Fun Fact: High Bitcoin fees was the main reason that Bitcoin Cash was created! Every system in the world can only handle a certain amount of transactions before it becomes overloaded. For example, although in 2016 Visa only process an average of 1,667 transactions per second, it has the ability to process over 50,000 per second if it needs to, but cannot exceed much further than that. On the other hand, you have Bitcoin. Even though Bitcoin is the most popular cryptocurrency in the world, it is only able to process a maximum of 7 transactions per second. This is a huge scalability problem that Bitcoin must resolve if it wants to achieve the dream of becoming a global payment system. Firstly, when sending XRP from one wallet to another, it only takes a few seconds for the transaction to be confirmed. Clearly, this makes Ripple a much better alternative to Bitcoin when it comes to the speed of transactions. When it comes to transaction fees, Ripple is practically free because the standard cost to make a transfer is just 0.00001 XRP. To put this in to real-world numbers, even when XRP reached its all-time high in January at $3.29, this would have amounted to a transaction fee of just $0.0000329. This means that you could send over 30,000 transactions before you paid $1 in transaction fees! So, what about scalability? Well, once again, the Ripple coin performs significantly better than Bitcoin. Remember how I mentioned earlier that Bitcoin can only handle 7 transactions per second? Well, Ripple can process more than 1,500 per second! All of the above statistics make Ripple ideal for the multi-trillion-dollar inter-bank industry. This is where banks send money to other banks located in other countries. At the moment, banks need to use a third-party organization located in Belgium called SWIFT. As a result, transactions are expensive and can take around 3 days before they are settled. Moreover, when banks are located in developing nations and have to trade in a currency that isn’t popular, they often have to perform multiple exchanges as there is not enough liquidity in the market. By using Ripple, banks can use XRP as a bridge of liquidity, saving institutions lots of time and money. So, now that you know how the two blockchain projects perform, the next part of my Ripple vs Bitcoin guide is going to discuss which blockchain is more decentralized. Decentralization means to not be controlled by any single person or authority. However, there are ongoing arguments in the cryptocurrency community regarding the fact that both projects aren’t as decentralized as they should be. 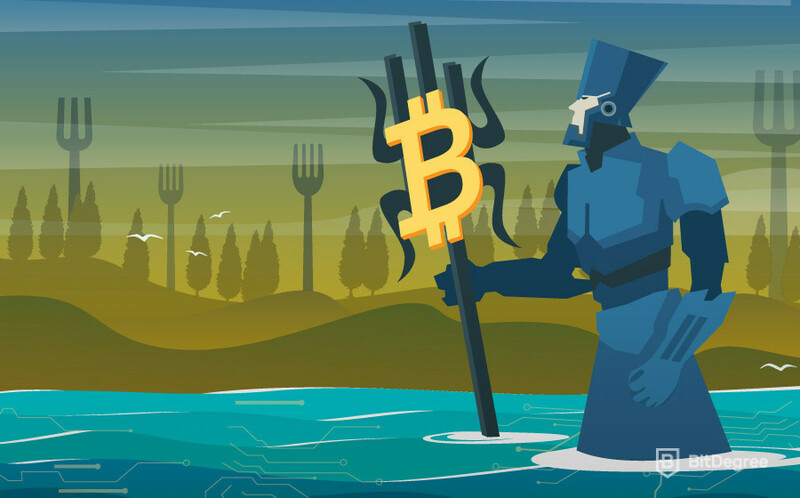 When it comes to Bitcoin, although it is certainly true that no single entity controls the network, things have changed since its early days. When Bitcoin was first launched, anybody could become a miner using a GPU or CPU, which are cheap to buy. However, it is now possible to use a piece of expensive hardware called an ASIC. ASIC’s are much more powerful than GPU’s and CPU’s, meaning that they will always have more chance of winning the mining reward. As a result, those who can’t afford to buy ASIC’s don’t have a fair chance of contributing to the system. This isn’t the only issue. There are now some powerful organizations which manage ‘Mining Pools’, in which different Bitcoin miners join their resources together to ensure that they have the best chance of winning the Bitcoin mining reward. They build Bitcoin mining farms consisting of thousands of ASIC devices. The idea is simple – the more ASIC devices you have, the more chance you have of winning the reward. Most of these mining pools are located in China, where electricity costs are really cheap. 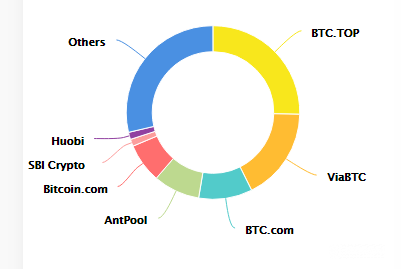 When I last checked the statistics (which you can see below), just four mining pools control more than 50% of the total Bitcoin hashing power. This puts a lot of power in to the hands of a very small amount of people, which goes against the decentralized idealogy of Bitcoin. There are also concerns from cryptocurrency fans that Ripple XRP is not as decentralization as it should be. Firstly, unlike Bitcoin, the Ripple coin is controlled by a company called Ripple Labs. It is important to remember that although they do not have the power to amend transactions or control people’s funds, they do control the supply of XRP. At the time of writing, June 2018, there are approximately 60 billion coins in circulation, of a total supply of 100 billion. The big problem is that the remaining 40 billion (40%) is controlled by the founders of Ripple – Ripple Labs. They have the power to do what they want with the coins, meaning they technically have the ability to manipulate its price. If Ripple Labs decided to issue a large amount of the coins they control, it could affect the price in a negative way. The other concern I found when conducting research for this Ripple vs Bitcoin guide, is that some people don’t like the fact that the blockchain isn’t maintained by the XRP community. In the case of Bitcoin, although the system has become dominated by large mining pools, anyone can attempt to contribute to the network by purchasing the required hardware. This isn’t the case with Ripple as it isn’t possible to mine XRP. Instead, the network uses something called “Transaction Validators”. The only people that can become a transaction validator are the banks that install the technology. Technically speaking, it is still decentralized because no single validator can take control of the network, nor can they amend or manipulate a transaction. However, some people think that everyone should have a chance to contribute to the network, not just financial institutions. So, now that you know some of the concerns that people have regarding the decentralization of both projects, the next part of this Ripple vs Bitcoin guide is going to discuss how transactions reach consensus. Bitcoin vs Ripple: How do They Reach Consensus? Neither of these protocols require a third party to confirm, verify and audit transactions. So, how do they do it? Firstly, let me quickly explain what a consensus mechanism is. Every blockchain uses a cryptographic algorithm to confirm that a transaction is valid without going through an intermediary. This ensures that the person sending the money actually has the funds, and it also makes sure that the funds are not spent twice (double-spending). Every device that is connected to the Bitcoin or Ripple network is called a node, and for a transaction to be confirmed, a percentage of nodes must “Reach Consensus” — which basically means they agree that the transaction is valid. Bitcoin and Ripple each use a different consensus mechanism, which I will discuss below. 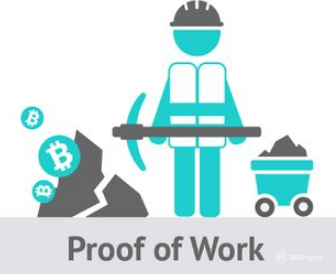 The first ever blockchain consensus mechanism was created by the developer of Bitcoin, and it is called Proof-of-Work. The best way to understand Proof-of-Work is to think about a really difficult calculation. The Bitcoin network generates a random calculation that is so difficult that no human could solve it. Instead, it requires a large amount of computational power to solve. The calculation takes 10 minutes to solve. Once it is solved, the Bitcoin transaction is confirmed as valid. Every single node that is connected to the network competes with each other to become the first device to solve the calculation. Whoever gets there first, wins the Bitcoin mining reward. The main problem with the Proof-of-Work model is that it requires really large amounts of electricity. For example, a recent study revealed that Bitcoin mining consumes more electricity than 159 individual nations! The second issue with Proof-of-Work (as I discussed earlier) is that it allows people to use really expensive hardware, meaning that those who can invest more money have a much higher chance of winning the Bitcoin reward. Thirdly, and possibly most importantly, the Proof-of-Work model has contributed to the issues of high fees, slow transactions and the inability to scale. So, now that you know what consensus mechanism Bitcoin uses, the next part of my Ripple vs Bitcoin guide is going to look at what Ripple uses! The Ripple blockchain uses a consensus mechanism called Federated Byzantine Agreement (FBA). Just like Bitcoin and its Proof-of-Work model, FBA seeks to reach consensus among different nodes. In FBA, each node will trust a limited number of other nodes, which is known as a “Circle”. The Ripple network has lots of different circles, which each overlap each other so that essentially every node is in some way connected. Transaction Validators that are used to verify transactions (banks that use the technology), they are individually selected and accredited prior to them having the ability to engage in transaction verification. This means that in reality, none of the banks that use the technology are going to want to manipulate consensus, as they are using it to support their own transactions. Even if they did, it would be clear for all other Transaction Validators to see, who would simply reject the transaction. Unlike Bitcoin, Ripple and its FBA consensus mechanism is not required to solve really complex calculations, meaning that it uses far less electricity than Bitcoin. This makes it a more efficient system and ensures that transaction fees are kept low. Ultimately, in the few seconds that the system needs to confirm a movement of funds, at least 80% of the Transaction Validators must reach consensus to mark the transaction as valid. So, now that you know about the two consensus mechanisms that are used, the final part of my Ripple vs Bitcoin guide is going to look at how the projects have performed so far! First though, here is a comparison table so you can recap on some of the main differences between these two projects! When people have the Ripple vs Bitcoin argument, one thing that everyone can agree with is that both blockchain projects have performed outstandingly. However, being the original cryptocurrency, Bitcoin has always been the number one coin in terms of value, market capitalization, adoption and real-world usage. The year 2017 was its most successful year to date, whereby BTC increased its value by more than 2,000%. By the end of the year, Bitcoin reached its all-time high of $20,000, with a total market capitalization of just over $320 billion. To put this in to perspective, this amounted to a higher market capitalization of both Goldman Sachs and Morgan Stanley! In terms of real-world usage, more and more vendors are beginning to accept Bitcoin as a payment method. This is especially true in Japan, where it is now possible to spend Bitcoin in over 200,000 different stores! Other well-known organizations that accepts Bitcoin includes, Microsoft, Expedia, PayPal, Overstock and even Virgin Galactic. However, it will take a very long time before Bitcoin is used as a main-stream global payments system. The main reason for this is that the developers need to fix its performance issues. Transaction times of 10 minutes, high fees and scaling levels of just 7 transactions per second are a million miles from a sustainable global payments system. The good news is that the team are working on the second layer of payment technology on top of Bitcoin called “Lighting Network”, which will hopefully take Bitcoin to the next level with fast, cheap and highly scalable transactions! So, what about Ripple XRP? Ripple is now the third strongest cryptocurrency in terms of market capitalization. Just like Bitcoin, the Ripple coin had an amazing year in 2017. At the start of the year it was worth just $0.0065, however by the end of it this rose to a massive $2.40. When it comes to the actual objective of the parent company, Ripple Labs, they are making some really good partnerships with some of the largest banks in the world. In fact, more than 100 different financial institutions are now testing out the Ripple protocol, including Santander, Bank of America and Credit Agricole! In the future, it is hoped that the financial industry will use XRP to settle their inter-bank payments. The entire industry is worth trillions of dollars each and every year, so if everything goes to plan, the value of XRP could soon see new all-time highs. This is not investment advice though. And that’s the end of this Ripple vs Bitcoin guide! Before you opened this article, you were unsure of the main differences between the two. However, if you have read this guide from start to finish, you should now have a really good idea of what sets these two crypto-powerhouses apart. As you now probably know, the Ripple blockchain performs much better than Bitcoin. It performs faster transactions, cheaper transactions and more scalable transactions. Not only this, but the Ripple consensus mechanism is much better for the environment — it does not waste large amounts of energy. Ripple’s goals are different to Bitcoin’s though, so don’t think of Ripple as becoming “the next Bitcoin”. Bitcoin is still (as it always has been) the number one cryptocurrency. I personally believe that Bitcoin is more suited as a store of value rather than a payment system though, in a similar way to Gold or Silver. However, the most important thing is that the next Bitcoin upgrade, the Lighting Network, is successful. This will make Bitcoin more usable as a payment system. So, which cryptocurrency do you prefer after reading this Ripple vs Bitcoin guide? Have you decided to choose one over the other, or are you like me and would prefer to have investments in both? Please let me know your thoughts in the comments section below!